Two of the diners sitting at our table said the same thing. There are two ways to take that comment. The first is that Babur serves excellent food (which is does). It has received many plaudits since it opened in 1985, including being named London’s best Indian restaurant in the Zagat 2013 guide. The second is to why wonder you’d come to an Indian restaurant if you don’t like Indian food. But like all contemporary Indian restaurants, you’re going to get more than the usual list of old-school favourites at Babur. So you can order Buffalo Lal Maas with steamed rice (£15.25), a dish where the meat is clove smoked and served in a dark Rajasthani sauce. Or you can go for Pickling Spiced Duck Breast (£14.95), which comes with a sweet and sour plum sauce and carrot mash. We are, of course, told the where our food is sourced – Laverstoke Park farm and Gressingham respectively, names sure to bring excited organic squeals from some quarters. We aren’t told where the rabbits come from but the pot-roasted Mustard Rabbit (£14.25) is a broth with delicate tastes of ginger and mustard. 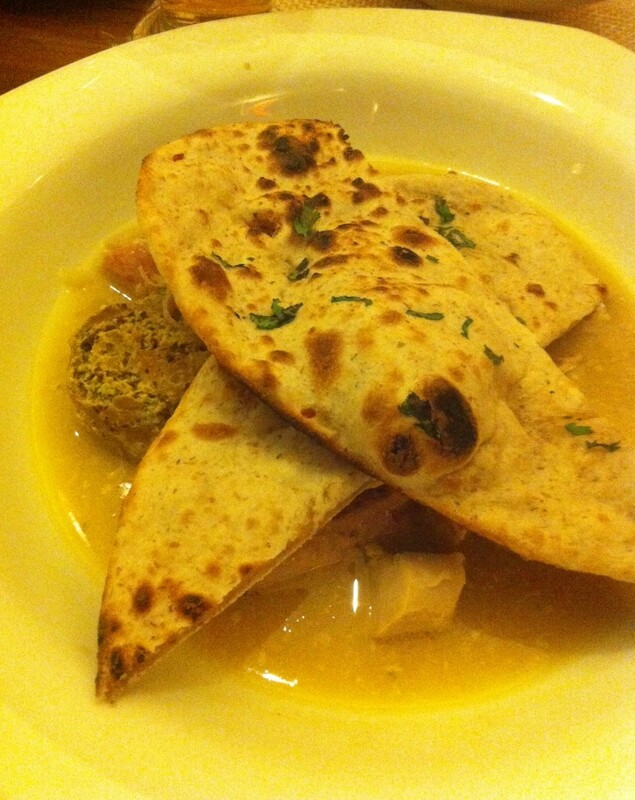 It comes with a garlic roti. Chicken Biryani (£13.95), Chicken Lababdor (£12.95) and Chicken Chettinad (£13.75), the later with a fool’s cap dosa as a quirky lid, are there for those who prefer their ‘curry’ dishes to be more than meat with a sprinkling of spice. 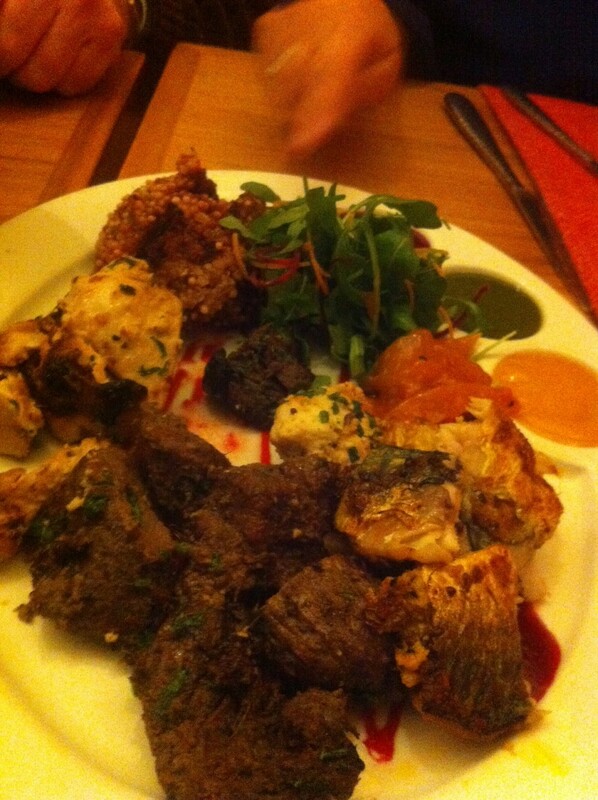 The starters (as recommended by the waiter ‘for large groups’) was a nice tasting mix of Chicken Tikka (£6.95), Lamb Tikka (£7.95), Beetroot Cutlet (£6.75) and pan-seared mackerel (£7.25), all of which get the thumbs up. And it was the right amount. Unfortunately, buoyed by our large table accepting his offer to choose the starters, the waiter hoisted way too many side and rice dishes on us when it came to the mains. The creamy Dal Makhani (£5.25) was the favourite side dish our up-seller came up with. Service overall was friendly but a bit casual, which we didn’t expect from a restaurant of this calibre. One of the mains was wrong (“sorry, I can’t read my own writing,” we were told by the same waiter who could clearly read his own writing when it came to the extra sides), although in fairness this problem was fixed pretty quickly. And then the wait for the desserts was sooooo long that the chatty end of the table ended up asking for the bill and ordering taxis because they assumed the few sorbet lovers has eaten already. Your wife might like it but she will clearly have to be patient whether she is a fan of Indian food or not. Babur, 119 Brockley Rise, Forest Hill, SE23 1JP. Tel: 020 8291 2400. E-mail: mail@babur.info. Open: daily noon-2.30pm (Sun noon-4pm), 6pm-11.30pm.